Next Level Communications. Ricoh’s Clickable Paper. Interactive print methods such as augmented reality (AR) and quick response (QR) codes are on the rise. These solutions offer a link between physical and virtual worlds, especially with the use of digital print technology. While AR has great potential in retail and e-commerce sectors, it’s also making waves in education and publishing due to its ability to cost-effectively provide a deeper, more interactive experience for students and readers. The Introduction to Graphic Communication, published in 2007, is an educational book that discusses the graphic communication industry’s past, present, and future prospects while also covering new printing and imaging technology issues impacting day-to-day communications. In April 2018, it was decided that the book needed updating. “Not only to reflect the changes in print itself but also to highlight the many ways in which the internet and mobile technology have affected the graphic communication equation,” says John Parsons, co-author of the revised edition, Introduction to Graphic Communication. The co-authors ultimately decided on Ricoh Clickable Paper to demonstrate print’s connection with mobile technology. Clickable Paper is an interactive AR solution that can be used with any type of printed or digital media such as brochures, magazines, newspapers, and posters. According to Parsons, the benefits of using Clickable Paper in publishing work is bringing the best of both worlds—deeply engaging, tactile learning possible with print plus the discoverability and updatability of online media. Dr. Harvey Levenson, co-author, Introduction to Graphic Communication, worked with Ricoh at the California Polytechnic State University to develop and test Clickable Paper. “Hence, when it came time to consider a second edition of Introduction to Graphic Communication as a unique, never-before-published-book, using Clickable Paper came to mind,” he explains. By using Clickable Paper, Levenson says the project provides an opportunity to publish a book that is seminal and a model for how books in the future can be published to appeal to different learning styles. Levenson also disagreed with the notion of using QR codes and describes them as design impediments. “They are ugly and interfere with the aesthetic look of a printed piece when design-appeal is important,” he offers. Further, to activate a QR code, a camera or scanner must be aimed properly. Unlike QR codes, he says the invisibility of Clickable Paper and its full-page sensitivity makes it unique as an AR embellishment. For this project, the co-authors selected a RICOH Pro VC60000 to print 1,500 book copies on 80# CVG silk book stock and 10pt C1S cover stock. According to Parsons, the VC60000 is well suited as it provides high-quality printed output with relatively short runs, a near requirement for book publishing. Heeter of Canonsburg, PA is expected to print future book runs. From job submittal to finished book, it took between eight and nine months to produce the newest edition of Introduction to Graphic Communication. Future book copies are expected to be printed on demand. “Since this was the first of its kind, a lot of planning was involved,” adds Levenson. Compared to previous projects, this book stands out for its multi-media dimension. “The book communicates with the reader, and the reader can communicate with the book,” offers Levenson. It includes chat group possibilities, links to social media, and communicating directly with the authors. “The AR part of this book is the exceptional, interactive video environment created by our use of the Viddler training portal,” adds Parsons. The book received positive reviews and response, partly due to its multi-media dimension. In fact, Levenson expects Introduction to Graphic Communication to be adopted by many schools that teach graphic communication and related disciplines, and by companies for employee training. Despite interactive print making waves in the publishing industry, there are still few requests for this type of value-added print method. According to Levenson, today’s demands are low because few clients, publishers, and authors know about it. However, awareness is growing. “We hope the Introduction to Graphic Communication makes the print buyer community—particularly book publishers—aware of the benefits of interactive print methods,” says Levenson. While these were produced on a RICOH Pro VC60000, Clickable Paper works with any printed output. 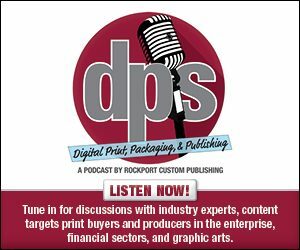 “To be specific, any traditional or digital printing process would work including lithography, flexography, gravure, screen printing, letterpress, electrostatic, electrophotographic, as well as inkjet,” says Levenson. However, Parsons believes Ricoh’s approach is superior to these, since it does not impose an added burden on the print designer. “It recognizes the page itself—even a page printed years ago—as the basis for the AR experience,” he says. AR technologies like Clickable Paper are an easy, intuitive process that converts traditional print into a multi-media experience, appealing to a variety of learning styles and industries. “Some people learn best by reading, others by viewing videos, and others by listening. And many people like the look and feel of a printed book. Ricoh’s Clickable Paper offers all of this,” says Levenson. While Introduction to Graphic Communication is currently the only book produced by both co-authors that involves interactive print, Parsons says they plan to produce separate chapters as self-contained booklets—using the same interactive approach.